The very first anti-almond milk article was apparently written by dietician Tamara Duker Freuman, a paid "media spokesman" and consultant with the dairy industry. Mother Jones journalist Tom Philpott, also cofounder of Maverick Farms (which exploits and slaughters animals) built on that with his juvenile yet viral article "Lay Off the Almond Milk, You Ignorant Hipsters." Learn more about Philpott's clear pro-meat/anti-vegan bias below. It may seem outrageous that a single almond requires about 1 gallon of water to produce (a serving is 23 almonds) – but not when you consider that a single egg requires 53 gallons, a hamburger 660, and a gallon of dairy milk 880 gallons of water to produce (sources in graphic). And almonds are generally consumed quite sparingly compared to eggs, meat, and dairy, the true water-guzzling luxuries that are nevertheless treated as daily staples and the main dish. If you are assuming the real culprit is almond milk, there are actually hardly any almonds in commercial store-bought almond milk, with the leading brand estimated to be composed of only 2% almonds. Additionally, water use is only one part of the story. 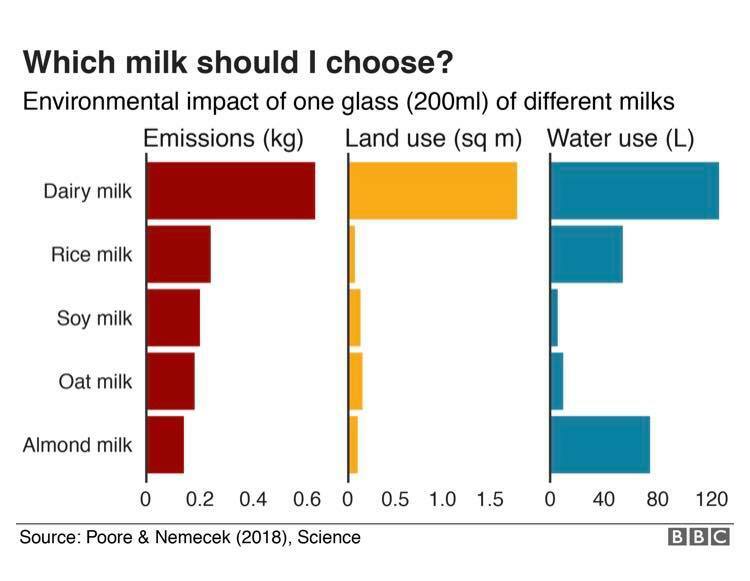 Among other environmental externalities, dairy milk has much higher greenhouse gas emissions and land use requirements (not to mention it’s inherently cruel to produce, entailing things like forcible breeding, calf removal, and slaughter). Poultry takes “just” 61% as much water as red meat to produce an equivalent amount. Water use: 15% of CA ag water is used to grow alfalfa hay for livestock feed, used mostly for dairy, which is part of the total of 47% of California's water used for meat and dairy (note this doesn't even include the animals' drinking water or that used for sanitation, slaughter once "spent," etc.). No, it doesn't make sense to grow most of the world's almonds in a drought-stricken region, and historically they have been grown elsewhere – but it makes even less sense to raise animals and grow their feed there (or anywhere else for that matter). ...All so we can take 6.5 gallons of liquid meant for her last baby calf. Additionally, cheese requires 10 times the liquid milk to produce; dairy-based Greek yogurt and butter even more. How can this outrageous extravagance possibly of "dairy" be justified? In conclusion, if you'd rather skip the almonds or go light on them, by all means, go ahead. A variety of different nuts, as well as plant-based milks and products like cheese and ice cream are available. But vilifying almonds and almond milk while letting dairy and other animal agriculture off the hook is nonsensical. The above graphics are hyperlinked to each original full-size image on our Facebook page. Mother Jones journalist Tom Philpott is also cofounder of Maverick Farms, which exploits and slaughters animals (pictured below). Although he has claimed that sharing this kind of info is an "attack," it is all factual. "Your Almond Habit is Sucking California Dry"
"What America's Nutty Demand For Almonds is Doing to California"
"Here's the Real Problem with Almonds"
"Invasion of the Hedge-Fund Almonds"
"Lay Off the Almond Milk, You Ignorant Hipsters"
"Boy, Hipsters Sure Are Defensive About Their Almond Milk"
"Organic Milk Proves Higher in Healthy Fats"
"U.K. Organic Milk Better For You Than Conventional, Thanks to Cows Grass-Based Diet"
"If you want more happy cows, agitate for more slaughterhouses and dairy facilities." "...I helped start Maverick Farms in 2004 and immediately started trying to source local meat and dairy for our farm dinners." "What's the point of almond milk, anyway?" "The water-intensive nature of almond milk, of course, is no secret." "As for me...I go for organic kefir, a fermented milk product." While Mr. Philpott says of almonds, "Given their rather intense ecological footprint...we should probably consider them a delicacy," leading scientists and environmental groups say it's meat products – not any plant – that need to be considered a luxury, if eaten at all. Please think critically about the origins of and motivations for anti-almond myths before spreading.